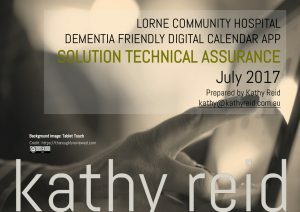 When Lorne Community Hospital needed to undertake technical assurance on a solution proposal for a mobile application and digital development project, they reached out to engage me. The solution proposal was analysed, and a full assurance report provided within a two-day turnaround. Lorne Community Hospital needed a trusted technical and digital consultant to provide project assurance on a solution proposal – and we delivered with a two-day turnaround.